I am not sure that many people know this, but my roots are in designing. In the early days of Anzula, I crocheted accessories and hand spun yarn to sell at craft fairs, farmer's markets, my local yarn shop and a record store. I published a few of my patterns way back in the day, and occasionally designs come to me and I still knit them up. But I don't usually bring them out in public because I don't have the time to write them up. Last fall, Justin and I were on one of our tours through Arizona and Texas and I had a skein of For Better Or Worsted with me. I didn't know what I wanted to knit, mostly just something that I didn't have to think about and could work on while in yarn shops. I cast on a bunch of stitches and did what comes naturally. I knit. What first began as a nothing that was just something for me to do in my down moments, became a For Better Or Worsted Cowl that I needed a pattern for because others saw me knitting it and wanted to have one also. We were getting ready for TNNA and Stitches West, and I knew I would have little to no time to write it up, so I asked my friend Miriam if she could help me out. 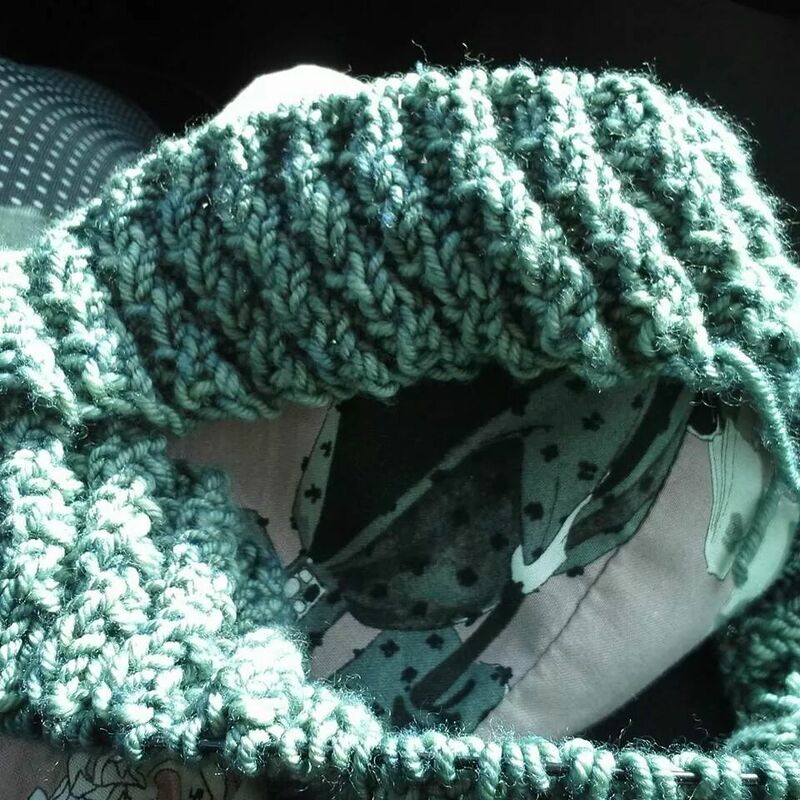 I sent her the knit, and she wrote the pattern and the Shifting Rib Cowl was born. It is one of my favorite go to knits. I have knit two in For Better Or Worsted, and one in Cole. This summer I cast on another one while Lacie and I were in New York. She needed something to knit and at some point took over knitting it. When we headed home she left it in the truck, and I decided to teach Logan to knit on it. He knit a few rows, then wanted to start his own project. It continued to sit there until this trip. I finished my sweater and picked it up. I had already made the decision to do this one a bit differently, I wanted something I could truly cuddle up with. For Better Or Worsted feels so good against the skin so this would be a two skein version with major color blocking. Logan loves to drive, so I get a lot of knitting time on the road. It feels like this one knit itself. I'm pretty pleased with how it came out.